How to be happy at work, at play, with our money and with our minds. The first two are among the most popular TED talks ever recorded. Shawn Achor, author of “The Happiness Advantage“, explains why we believe that we should work to be happy, but could that be backwards? 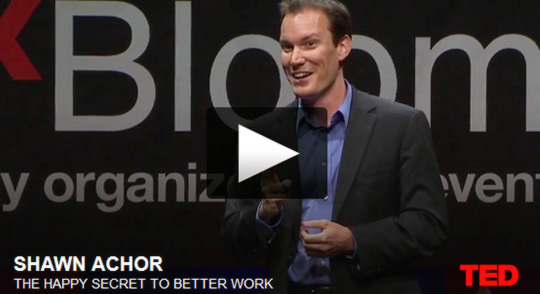 In this fast-moving and entertaining talk, psychologist Shawn Achor argues that actually happiness inspires productivity. Michael Norton, co-author of “Happy Money: The Science of Happier Spending,” shares fascinating research on how money can, indeed buy happiness — when you don’t spend it on yourself. Listen for surprising data on the many ways pro-social spending can benefit you, your work, and (of course) other people. What is happiness, and how can we all get some? Biochemist turned Buddhist monk Matthieu Ricard, author of “Happiness: A Guide to Developing Life’s Most Important Skill,” says we can train our minds in habits of well-being, to generate a true sense of serenity and fulfillment. Using examples from vacations to colonoscopies, Nobel laureate and founder of behavioral economics Daniel Kahneman, author of “Thinking, Fast and Slow,” reveals how our “experiencing selves” and our “remembering selves” perceive happiness differently. This new insight has profound implications for economics, public policy — and our own self-awareness.